For the figure below [not the original one! 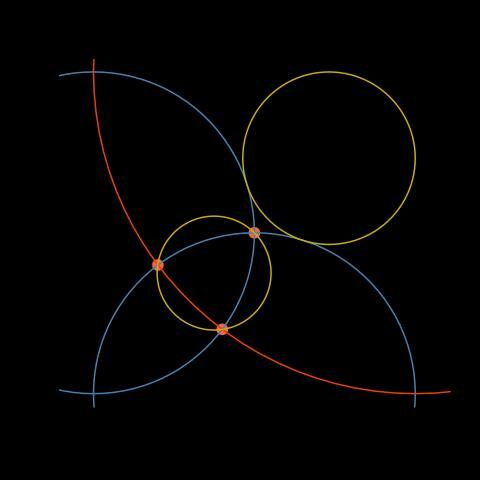 ], describing two (blue) half-circles intersecting with a square of side 20cm, and a (orange) quarter of a circle with radius 20cm, find the radii of both gold circles, respectively tangent to both half-circles and to the square and going through the three intersections. even though Heron’s formula was enough to produce the radius. In both approaches, this radius is 3.54, with the position of the centre O’at 10.6 from the lower left corner. When plotting these results, which showed consistency at this level of precision, I was reminded of the importance of plotting the points with the option “asp=1” in plot() as otherwise, draw.circle() does not plot the circles at the right location!